All the practical information you need to know about Dorrigo National Park. From Armidale, drive east along the Waterfall Way for about 90 minutes. You'll see the park turnoff on the left, about 2km past Dorrigo. Travel south along the Pacific Highway, cross the Bellinger River and take the Waterfall Way exit to Dorrigo via Bellingen. Approximately 2km before Dorrigo township, turn right at Dome Road and continue for approximately 1.6km to the Dorrigo Rainforest Centre. 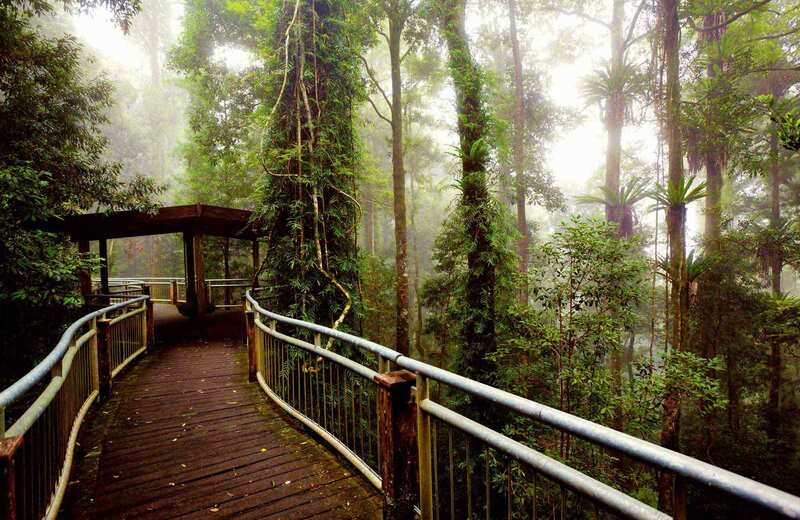 The weather at Dorrigo National Park can vary from warm to mild to cool, depending on the time of year you visit. The summer months usually have the highest rainfall. The rainforest is alive with birdlife - walk the Lyrebird Link for a close up view. Escape the summer heat along one of the waterfall tracks and feel the coolness envelop you. Dorrigo is a serene country town and the gateway to Dorrigo National Park. Its close to the edge of the escarpment above the Bellingen Valley. Bellingen is a laid-back, tree-lined town with a New Age vibe. It's set in a luxuriant valley beside the Bellinger River. Coffs Harbour is a coastal city on the North Coast, packed with things to do. It's surrounded by lush forests and national parks.